They had their 6 month check-up and shots today. Everyone is doing great and growing fast. They are all giggling, rolling over, and grabbing for things. We started them on cereal two weeks ago, but the doctor said he wouldn't recommend giving them cereal until they are 6 months adjusted (two more months). Therefore we are going to stop for a few weeks and see how everything goes. The doctor said most people start to give cereal to help babies sleep longer, but they've been sleeping through the night since they were 10 weeks old. Ricki is a superwoman, she is taking caring of all three of them by herself during the day. She started 'Mommy and Me' classes this week. Everyone had a great time! Ricki, Zachary and Lindsey are on the cover of the October issue of Kiplinger's Personal Finance Magazine. October's cover story is "How to be a Tax-Cut Winner". Our whole family has a two page spread on pages 50 & 51. Kiplinger found us through the Internet. They were looking for a family with multiples to explain how the new tax bill works and surfed onto our Home Page. They sent a photographer from New York to spend an afternoon with us and take pictures. I'm sorry that I haven't updated the page recently, but for the past three months I've been creating the MOST (Mothers of Supertwins) home page (http://www.MOSTonline.org). Sunday the babies started eating vegetables. So far they've had carrots and peas. All three like carrots, but Hannah's not too big on peas. Zachary is able to sit up unassisted, Lindsey's has both of her front bottom teeth, and Hannah just loves to sit here at the computer and bang on the keys (could we have another engineer in the family?) They've all been "baby talking" non-stop. It's so much fun to listen to it and watch them blossom into "real people." All three are rolling and moving around on the floor, so much that we can't take our eyes off of them for a minute! They all love Cleo and spend ours playing with her and trying to pet her. At the beginning of the month we took the whole family to Ft. Lauderdale to spend some time with my parents and sister's family. My parents hadn't seen them in several months and couldn't believe how much they'd grown and interact with people. We were very excited to spend some time with my sister and her family, who hadn't met the triplets before (Debbie was 7 months pregnant when the babies were born). They were very well behaved during the long car trip (five hours). Zachary is big enough that he is facing forward in the car seats, and the girls are still facing backwards. Zachary's using a highchair in restaurants and can crawl backwards (still working on going forward). Hannah is just beginning to sit up on her own. While we were in South Florida, Ricki met for the first time someone she'd be corresponding with on-line for a year. Danielle found our web site after she found out she was expecting triplets and the two of them started emailing on a regular basis. They've become great friends, and were so happy to have finally met in person. We had dinner with her, her husband, and their 6-month old triplets: Louis, Anthony, & Gina. We are experimenting with all types of stage II vegetables and fruits. So far everything is a hit except green beans. Lindsey is still the smallest, but she should catch up quickly since she's the eater of the bunch. Zachary is around 18 lbs, Hannah 16 lbs, and Lindsey 12 lbs. We will get their official sizes and weights at their next doctor's visit on December 5th (their 9 month birthday). Zachary is crawling!! Both girls are sitting up on their own and are very mobile, but haven't figured out the crawl yet. With three mobile babies we discovered you can't turn your back on them for a second! Last Friday (12/5), they had their 9-month checkup, and we were pretty close on their weight estimations: Zachary was 18 lbs. 11 oz., Hannah was 16 lbs. 4 oz., and Lindsey was 12 lbs. 13 oz. They've been starting to eat "people food" (thanks to encouragement from Ricki's mom, Sima). Bagels were a big hit, and so was Ritz Air Crisp crackers. Cleo is a wonderful "big sister" to them. She loves the fact that they are now able to interact with her and play. We just can't wait until Spring so we can take them out in the backyard. 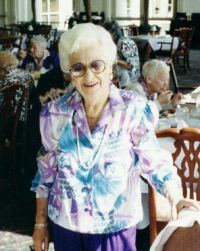 We took the family to South Florida for my grandmother's 90th birthday party. Everyone had a lot of fun and the triplets were a big hit with all of her friends. Six of the seven great-grandchildren were at the party. We stayed at my sister's new house, which is baby-proofed, so the kids felt right at home there. While we were down south, we met with another of Ricki's internet friends that she met on-line. 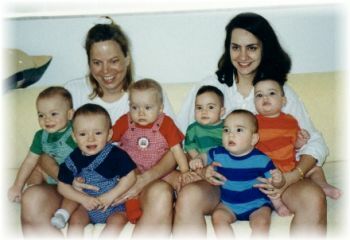 Karen's triplets were born a month before ours and the two of them emailed through-out their pregnancies. They were in Florida for a vacation, and we lucky enough to be able to spend time together. We spent the afternoon with Karen, Pierre and their triplets: Samantha, Alessandra, and Jacques. Ricki and the babies started 'Mommy and Me' classes again this week. There are few of the kids from last term, and some new ones too, including a set of identical twins. We are experimenting with all types of foods. So far pretzels, bagels, crackers, fruit and steak have been a big hit! We're experiencing a "teeth boom" right now: Lindsey has six, Zachary has five, and Hannah has four. It seems like every every day, someone is cutting another tooth! It's hard to believe they turn a year old in two weeks. The past year has flown by so quickly. We're planning two birthday parties for them. A big birthday with relatives and friends (about 40 people) on March 7th, and one at Mommy & Me for their "school" friends on March 4th. We gated off our dining room (we don't have any furniture in it) and made it into a giant play room. Zachary is getting into everything. He has figured out how to open cabinets, swing open doors and follows us all over the house. He has taken a few steps holding on to things, but we're not encouraging him. Hannah started crawling last week, first on carpet and now has figured out how to do it on tile. Now she can chase Zachary and beat up on him (payback's a b**ch!). Lindsey's getting up on all fours and rockin, she should be crawling soon. They all had a stomach virus this week, but are starting to feel better. We are averaging about 15 diapers a day. We received our final delivery of formula (we received one year free from our local Similac representative.) They love pretzels, cheerios, spaghetti, and fruits. Lindsey is crawling!! Now they chase each other all over the house. They also follow us to whatever room we are in. It is real cute to see them all lined up crawling into a room. Zachary is starting to walk, but we are in no rush!! Last Thursday was their ONE YEAR OLD BIRTHDAY!! We actual had two parties for them. One with Ricki's Mommy and Me class and a big one on Saturday with over 30 relatives and close friends. The party was a blast and the kids received tons of presents. We had a Mickey and Minnie Mouse Cake and the bakery also made three 6 inch cakes for each kid. Let me just say, they destroyed their cakes!! We had their one year check-up and Zachary is in the 50th percentile, Hannah in the 40th percentile and Lindsey in the 5th percentile for one year olds (one needs to remember their adjusted age is 10 months, since they were two months premature). They doctor said they are just perfect and gave us permission to start whole milk.